Catcalls, wolf whistles, verbal slurs, pinches, stalking—virtually every woman has experienced some form of unwanted public attention by men. Off the street, in semi-public places such as restaurants and department stores, women often suffer the insult of being passed over by employees eager to serve men. How pervasive is this behavior? How dangerous can it be? What, if anything, should be done about it? 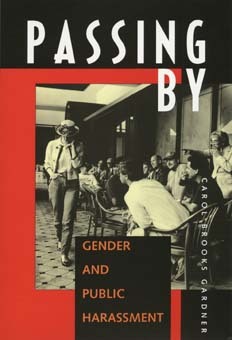 Passing By, an illuminating, unsettling work, explores the important yet little-examined issue of gender-related public harassment. Based on extensive research—including in-depth interviews with nearly five-hundred midwestern women and men—it documents the many types of indignity visited on women in public places. As Carol Brooks Gardner demonstrates, these indignities cross all lines of age, class, and ethnicity and follow a typical pattern whereby a man or men take advantage of a woman's momentary or permanent vulnerability. Beyond describing the scope and variety of harassing behaviors, the book investigates the different ways women and men respond to and interpret them. Gardner concludes, provocatively, that gender-based public harassment exerts a powerful control over women's feelings of comfort in the towns and communities where they live and work. Further, she defines it as a new category of social problem that shares much in common with sexual harassment and, in its more menacing form, requires legal remedy. Carol Brooks Gardner is Associate Professor of Sociology and Women's Studies at Indiana University, Indianapolis.